Of course, a time-honored method of learning a new tune is to read the available notation and/or tablature. But what brought you to the new tune in the first place? Likely, having heard it inspired you. Here is a a memorization suggestion, to go along with the “practice-one-hand-at-a-time” tip: Listen to the tune many times through before trying to play it. As I think back on that, I basically memorized the piece before I ever started to play it. I had a visual image in my brain of the hand-written lyrics and the song’s form. I also had an aural memory of the flow of the tune. So I already knew what was coming throughout the tune before I ever started to play it. I suggest that you try this memorization method with a new fingerstyle tune you want to learn. Listen to it many times through before embarking on playing it. 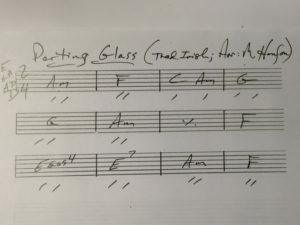 As a visual cue, you might handwrite a chord chart for the tune as a guide to its form: something simple, like the “Parting Glass” example at the top of this column. This visual guide, and having listened numerous times, will help your rhythm and timing (a huge bugaboo for readers of tablature, where timing markings are often deleted, or players can’t decipher them). These methods will also enhance your ability to anticipate what is coming next (a hugely important requirement for musicians). 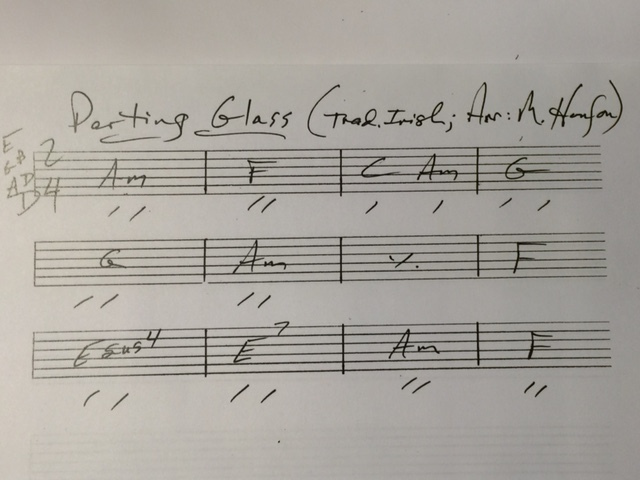 You also will have a good idea of the piece’s structure (AABA, or Intro/Verse/Chorus, etc.) before you ever begin. Many of my books have accompanying recordings: Art of Solo Fingerpicking, Travis Pick the Hits!, Great American Songbook, and Beyond Basics for Fingerstyle Guitar all are great sources of repertoire and technique. Hymns and Spirituals has my lovely DADGAD rendition of “Be Thou My Vision (Banks of the Bann)”. After hearing my recording of it, quite a number of folks have licensed that arrangement for use in their own recordings. Thank you! Copyright © 2016 Accent On Music LLC and Mark D. Hanson.